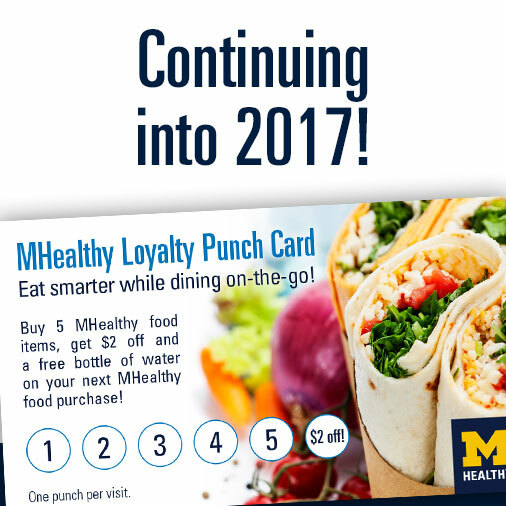 Due to its success, the MHealthy Loyalty Punch Card program has been extended into 2017 and will continue indefinitely! If you haven’t already, make sure to pick up your card at select cafés and carts within the U-M Health System. Each time you purchase an MHealthy food item, get your card punched. One punch per transaction. After five punches, get $2 off your next MHealthy food purchase plus a free bottle of water. Qualifying food items meet the MHealthy Nutrition Guidelines, which were created by a team of registered dietitians at U-M and emphasize whole grains, fruits, vegetables, beans, lean protein, low fat dairy and healthy fats. The program is sponsored by MHealthy, UMHS Retail Food Operations, Picasso and Aramark. Click here to learn more about MHealthy’s dining, catering and vending programs.